Christmas is well and truly on it’s way, and choosing a new Christmas jumper every year is certainly a tradition for me! Each year it has to be more outrageous or funky than the last and I always resort to wearing one on Christmas day over a smart/party outfit. The choice in the shops gets better year upon year. 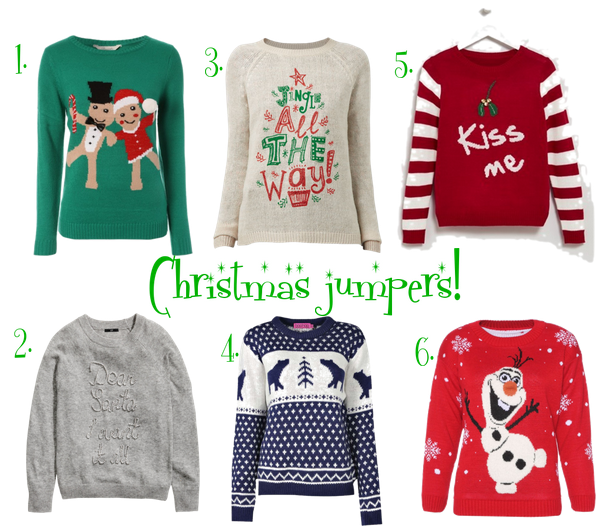 It was hard to whittle it down to six as I NEED all the Christmas Jumpers there are, preferably one for each day of December…But here are the special ones which made the cut! 1. Peacocks gingerbread Jumper – Gingerbread is one of my favourite festive treats and this jumper is just the cutest with the two gingerbread men holding hands, I love the use of the typical Christmas colours and it’s a firm favourite of mine! They have loads of other gorgeous jumpers like this on Peacocks too for really affordable prices. 2. H&M Dear Santa Jumper – My eyes seem to be drawn to this jumper every time I pop in store, it’s definitely one of the most subtle Christmas jumpers out there which is maybe why I like it, the beading is incredibly pretty and would make for such a stylish outfit, layered with blacks and greys. I definitely think we all need a subtle and an overly garish Christmas jumper in our lives! 3. New Look Jingle all the way Jumper – New Look always have a great selection each year, I really am a fan of the slogan Christmas jumpers and this one is reasonably priced at only £14.99. 4. Boohoo Penny Polar bear Jumper – I love anything with a Nordic pattern at winter time so this jumper is right up my street, although its classed as a Christmas jumper it could definitely be worn all the way through winter, it will match my hand knitted Nordic mittens too! 5. Matalan Mistletoe Jumper – Matalan is a shop I always forget about as my local one isn’t in the centre. But for me they are one of the cheapest places behind Primark, the striped sleeves are so quirky, they remind me of both candy canes and the handles of the Christmas Starbucks mugs haha, this is definitely not a bad thing though! 6. Amazon Olaf Frozen Jumper – I had to pick this one out for all the Frozen lovers out there. Amazon do lots of other character jumpers like this, I would say that Ebay is just as good a place as any to look as well and probably cheaper! Aside from these it goes without saying that Primark always come up trumps with their range of Christmas jumpers, so it’s well worth a look in there too if these don’t take your fancy! I think I’m going to have to buy more than one this year, ho ho ho! Don’t worry this is only the first of many Christmas posts to come!! Do you like Christmas Jumpers? Which one is your favourite? Have you bought one yet? Next Post #SotonMeetup Southampton Bloggers meet up!